So what’s all this monkey business about “TrustChimp™”? Hello. 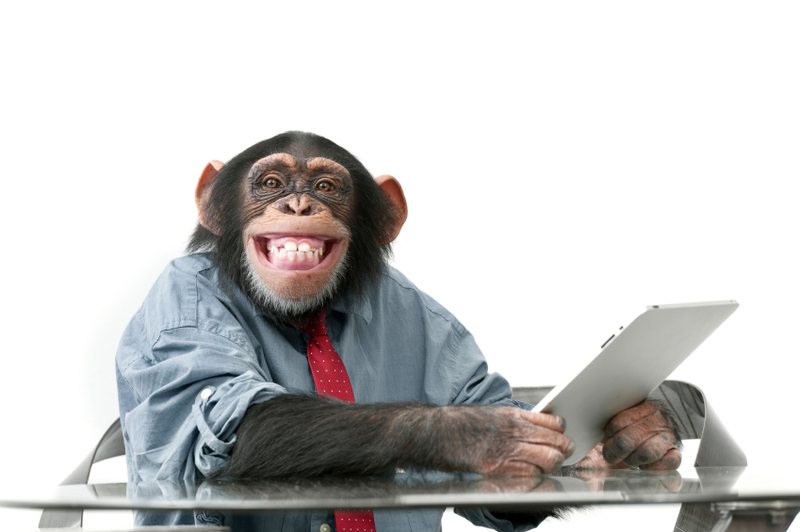 I may look like a chimpanzee, but I am actually a successful elder law attorney. Until a few years ago I had been involved in a large jungle project in which a thousand of my colleagues and I were attempting to write Hamlet on old typewriters. I quickly bored. After law school I took up elder law but quickly ran into roadblocks with trusts. Just when I was about to go back to handling DWIs, I ran into Bob Mason (more on Bob below). Bob took me under his paw and brought me right along. What I Discovered. It May Apply To You. There is good news. And there is bad news. The good news is that the topic of trusts and Medicaid and SSI and tax is so tough many lawyers don’t want to fool with it. That leaves more room for you to build a great practice in a nice empty clearing in a dense jungle crowded with too many other lawyers. Embrace the toughness. You’re smart. You want to succeed. You can do this. The bad news is that there are very few great resources to tap into even if you have the courage and desire. Continuing legal education offerings tend to be “an-hour-here-an-hour-there” micro-slices of a huge topic without any coherent relationship to the whole. Even if you have assembled a stack of reading materials, you can read and read and read and still not get it if you can’t plug the law into some real time experience. The trust forms available can be outrageously expensive. And then you have to figure them out. Finally, the lawyers who have already mastered this corner of the legal universe either don’t have the inclination, time or temperament to help others along (other than hit-or-miss on a list serve) because the masters are too busy with their thriving practices. Nope. You’re at the right place. I have recruited one attorney who has mastered the trusts, tax, public benefits jungle, and who actually likes organizing information, teaching and mentoring, and . . . well . . . who likes to have fun. He has joined me, an incredibly erudite chimp from the jungle, and we are offering up . . . TrustChimp™ to be your guide. Bob Mason is an elder and special needs law attorney pushing 30 years of experience. He is a member of NAELA’s Council of Advanced Practitioners, and a two time chair of the North Carolina Bar Association’s Elder Law Section. He is also a frustrated professor because he loves to teach and likes to help others along. Finally, I think he is a frustrated comedian. His jokes can be pretty bad. For a number of years Bob developed an email list of colleagues who wanted to receive regular updates of some of his trust materials. TrustChimp™ is a direct result of that list. And so here we are . . .
Bob’s Medicaid and VA Benefits Planning With Irrevocable Trusts outline, considered by many to be the best out there, is yours for the taking. And you’ll always be able to go back for updates. Other great downloads we’ll post from time-to-time. Instant access to the (still under construction but growing) TrustChimp™ articles library. Instant access to forums focused on trusts and other related topics . . . post questions, show others how smart you are. Advance notice of some other things we have up our sleeves.. Your days of hacking through the trust jungle are ending and soon you’ll be on the path to the sunny and blissful uplands of trust nirvana.